Traditionally, the nutritional evaluation of the relation between diet and health has focused on individual food constituents or nutrients separately. This approach, which links one nutrient to one health effect, may partly explain some of the discrepancies between a food’s predicted health effect based on its nutrient content and its actual health effect, when consumed as a whole food. The food matrix is defined as “the nutrient and non-nutrient components of foods and their molecular relationships, i.e. chemical bonds, to each other” (cf. National Agriculture Library, USDA). Foods have complex structures, which affect digestion and absorption and may generate interactions within the food matrix, there by altering the bioactive properties of nutrients in ways that are not predictable from the nutrition-label information. This appears more and more evident for the dairy matrix. There are differences between the metabolic effects of a whole dairy, and those of single dairy constituents, on body weight, cardiometabolic diseases (CMD) risk or bone health. For instance, despite the high level of saturated fatty acids in dairy fats, experts(1) agree that there is no association between the intake of dairy products and the risk of CMD or even with type 2 diabetes. They also pointed to the fact that the relationship between dairy and health differs, according to the subtype of dairy product. In addition, different processing methods and dairy structures can enhance interactions in the dairy matrix, thereby modifying the metabolic effects of dairy consumption. Therefore, the nutritional value of dairy products should be considered as the biofunctionality of the sum of nutrients within dairy matrix structures. Observational studies shows that yogurt consumption is associated to a reduction of the risks of obesity and type 2 diabetes, and accumulating evidence supports the role of yogurt consumption in weight management. Yogurt appears to have a neutral effect on the risk of heart and vascular diseases. In a recent review(2), the authors discuss the possible mechanisms underlying the association found by these studies and point out the potential effect of the yogurt matrix. 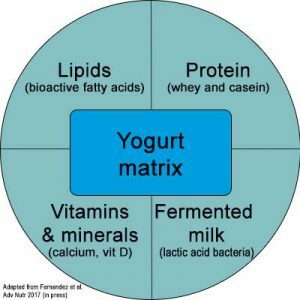 The yogurt matrix may play an important role in boosting the health benefits of its nutrients. The gel structure of the matrix may protect its nutrients and bioactive compounds against degradation and allow improved nutrient interactions. 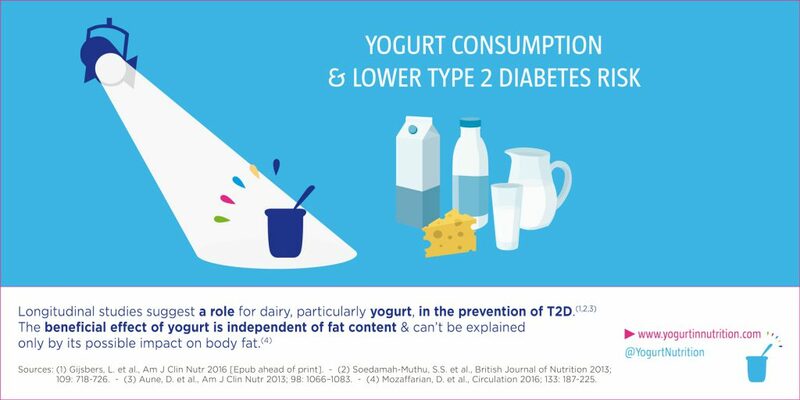 It may be responsible for the reduced incidence of type 2 diabetes in people who eat yogurt compared with milk and other dairy products. The fermentation process and live bacteria of yogurt may also bring health benefits. Yogurt is believed to have positive effects on the gut microbiota and intestinal barrier function – these effects may contribute to its cardiometabolic health benefits. Indeed, unbalanced gut microbiota (dysbiosis) and impaired intestinal barrier function can contribute to obesity, inflammation and type 2 diabetes. 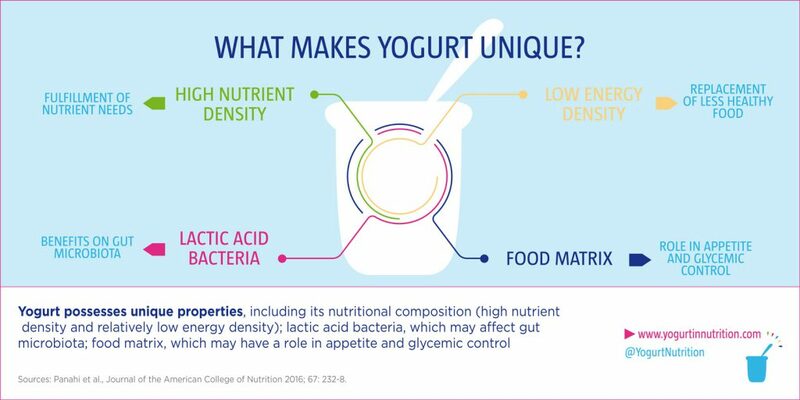 Consuming yogurts with live cultures may have important beneficial effects on maintaining a healthy and balanced gut microbiota. Moreover, bioactive peptides released during yogurt fermentation have cardiometabolic health effects: blood pressure-lowering, cholesterol-lowering, anti-thrombotic, anti-oxidant, mucin-stimulating, and immune modulating activities. Bioactive peptides may also help to improve insulin sensitivity. Yogurt contains also several bioactive fats and high-fat yogurt consumption has been associated with a reduced risk of CMDs. For example, medium-chain fatty acids (MCFAs) in yogurt have been associated with anti-diabetes effects and conjugated linoleic acid (CLA) have been linked with anti-obesity effects, and improved metabolic parameters associated with type 2 diabetes. Yogurt is also good source of calcium, which may also help to prevent type 2 diabetes through mechanisms that reduce nutrient deficiencies, control high blood pressure, prevent obesity and reduce inflammation. Last but not least, positive effects of yogurt on CMDs have often been attributed to the potential for yogurt to increase satiety, which may be due in part to its protein content. The protein quantity and quality are contributing factors to their effects on glucose control. As foods are much more complex than a single nutrient, many factors (nutritive and/or bioactive), mediate the relationship between food intake and health. This is particularly the case with the food matrix of dairy products. Protein ingestion can increase the ability to secrete insulin, and the ability to modulate insulin secretion and sensitivity varies with the source of protein. There are many more factors involved in glycemic management than just insulin, such as incretin hormones (synthetized by the gut). Among animal-based proteins, certain subtypes show negative, and other show neutral or positive effects on type 2 diabetes risk. A review(3) point out that a higher intake of dairy products (milk, yogurt, cheese and whey proteins) consistently shows a beneficial relationship with glucose regulation and type 2 diabetes risk reduction. If dairy proteins have more effects on insulin and incretin secretion compared to other animal proteins, the authors(3) underlines the interest of the food matrix of dairy products, contening several components which exerts beneficial effects on glucose control, insulin secretion and sensitivity. These components are among others: calcium, magnesium, potassium, trans-palmitoleic fatty acids, and sugars with low-glycemic index. These results shows that further focus on product types, characteristics and protein properties are necessary to better determine a product’s glucoregulatory abilities. Fernandez MA, Panahi S, Daniel N, et al. Yogurt and cardiometabolic diseases: a critical review of potential mechanisms. Adv Nutr 2017;8(6):812-829.